The project required more than 136 tons of natural Indiana limestone. A high end project like this won’t be the same if some kind of faux stone is specified. Natural stone from the Indiana Limestone Company graces The Vermeer, a landmark recent construction in Vancouver, British Columbia. 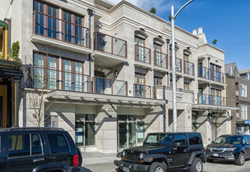 This high-end multi-use building embodies many elements incorporating classical architecture – a beautiful, traditional presence in a neighborhood dominated by contemporary glass buildings. The 21,000-square-foot structure includes residential and retail spaces. The stone façade is assembled of Indiana Limestone’s prized Standard Buff product, 2” thick on the south elevation and 1.5” thick on the north elevation. Natural Indiana limestone totaling more than 136 tons was required for the project, in both exterior and interior applications. Red Leaf Stone of Vancouver supplied the stone. Architectural Stonemasonry, another division of Red Leaf’s parent company, Red Leaf Architectural Products, Inc., fully detailed and fabricated the entire exterior and handcrafted unique elements including family crests and medallions prominently displayed at the face of the building. Sun Valley Masonry of Abbotsford, B.C., performed the stone installation. Project architect Jim Bussey of Formwerks Architectural, Vancouver, said several attributes of the stone contributed to its selection for The Vermeer. “Primarily, we chose Indiana limestone because of its color,” Bussey said, “but also for its proximity to French limestone and its durability in our climate." Indiana Limestone Company is unmatched as the premier supplier of Indiana Limestone in a range of beautiful and lasting building products. Founded in 1926 (with predecessor firms that had been quarrying limestone since the mid-1800s), ILCO today remains the provider of choice for this internationally renowned natural stone. Throughout an illustrious history in which its stone has made such iconic structures as the Empire State Building, National Cathedral, and the Pentagon, ILCO has reliably provided the highest quality products and services carefully tailored to the needs of the market with an environmental, natural focus.